Now that you have become interested in playing golf, how do you go about getting started? Lots of people just go down to their local driving range or par three course, hire some clubs and start hitting. Playing golf looks easy doesn’t it! Some begin by having a few tips on their swing from a friend who might also be fairly new to the game, but feels that he knows enough to offer advice. 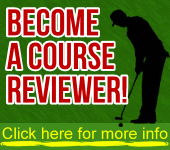 Even worse, is the golfer, who is a high handicapper, offering advice to the new recruit with tips on the game that have not brought much improvement to his own game. A raw beginner can be scared for life at this early stage. Some buy a second hand set of clubs from someone who has just bought themselves a new set, even though the person selling was 6’ 2” tall, had a 1” longer shaft with thick grips and the person buying was 5’ 7” small in build and hand size. Doesn’t matter though does it that the equipment will not suit as they were a bargain? Would you go out and buy a jacket without knowing if it fitted first. I don’t think so? These examples do happen and can start the new golfer off in the wrong direction. Well meaning but never the less bad advice can severely hinder progress. Beginners do not need to go out and purchase an expensive full set of clubs straight away. Remember you cannot buy yourself a game. Learn to walk before you can run. If possible have a few clubs specially made for you by an expert club fitter, maybe nos. 5, 7, 9 and sand iron. He will be able to make suitable custom fit irons for you, depending on age, swing shape and speed, stance angle and grip thickness. Your golf coach can also advise about proper equipment when going for lessons. As you improve add more clubs to the set. As your game develops and you grow in confidence you will probably know what type clubs you need through experience. Be patient golf is a game that takes time to master. It’s equally important to start by having proper golf instruction. Before even striking your first shot, have a lesson from a professional teacher. 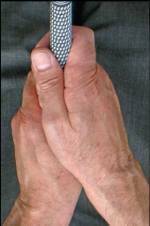 Learn how to grip the club correctly. Learn how to address or stand to the ball properly with the correct posture. Learn weight transfer from backswing to follow through. Learn how to hit down on the ball with an iron and take a divot. Golf instruction is like a dripping tap. Learn bits at a time. Don’t have too many lessons to soon; it can be confusing taking in too much information. One lesson a week for a month with practice in between is enough. Give your hands and body muscles time to get used to hitting shots. If you feel uncomfortable or just can’t understand what you are trying to achieve, ask the coach at the next lesson. In any lesson you are only going to absorb about 20% of what you have been taught. But you are learning are good habits that will last a life time. With correct coaching even slow starters will quickly develop. Often golfers who start playing without any professional instruction find that after about 12 – 18 months their game becomes worse, they seem to have stagnated. Then when starting a course of proper instruction find it even more difficult to improve at first because of all the bad habits they have to undo. For your first few weeks of playing golf, practice with lofted irons only. Start with a no 9 iron. It has plenty of face loft and a fairly short shaft. The loft allows the ball when struck on the downswing to rise into the air very quickly and carry about 100 metres in length. So there is not the urge to try and hit the ball too hard, as is often the case when using a more powerful club in search for distance. 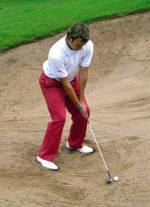 Then the golfer tries to hit the ball a long way by swinging too fast, usually with disastrous results. The shorter club allows a more compact swing making the player feel much more comfortable and can then concentrate on learning rhythm and timing , essential factors in striking the ball correctly. Don’t be bullied into hitting a wood shot until you are ready. The longer the shaft of the club and the straighter the loft on the face the more difficult it is to hit a proper shot away. Playing golf is fun when you have mastered a particular shot. Even a short shot. When you are able to hit groups of five or six consecutive good shots with a short iron, you will know you are ready to try your hand with the longer irons or even the woods. Improvement is taking place. When you have learnt how to play chip shots, bunkers shots and practised your putting stroke, you will feel the lure of the course, to go out and test your abilities for real. Then you will have to learn about etiquette, how to score, obtaining a handicap, what stoke index on a score card means etc. etc. However in quite a short time from your first ever shot you will soon be enjoying your first proper round of golf.